Guitarist Lee Ritenour takes time out to chat with Luxury Experience about his career and his latest release, Lee Ritenour - Rhythm Session, released on the Concord Music Group label. You have had a most interesting career to date beginning with playing with the Mamas and Papas at 16 to playing with Lena Horne and Tony Bennett at 18. From there your career has taken off in many directions: rock, jazz, funk, pop, blues, and Brazilian. It was the period of the guitar in all its glory in the mid 60's. I started playing at 5 years old by putting rubber bands on broomsticks. My father was musical and my parents bought me a guitar when I was 8. My father introduced me to Jazz and by the age of 12, I knew that I wanted to play professionally. It is amazing that you knew what you wanted to do for a career at such a young age. When GRP was putting together their 30th anniversary project, they selected your song from the 1985 Grammy-Award Harlequin release, Early AM Attitude. When you look back, did you ever imagine where you would be today? I did not come from a family of professional musicians; in fact, my father asked my teachers if I could make a living playing the guitar. I was passionate about the guitar, and I followed guitar icons such as Wes Montgomery, Jimi Hendrix, B.B. King, Segovia, and others. I met Dave Grusin at a very young age and they opened the door for me and allowed me to be a studio musician. I loved to listen to all types of music and studied all styles of playing; the only insurance policy a musician has is education. I studied all forms of guitar and through preparation and studying, and I continue stay sharp and try to stay in-tune with today's music and styles. How did you come to create the Ritenour Rhythm Sessions Competition? Originally created for guitars only, it has now expanded to include to other instruments. Where do you see that going? The whole concept started 3-years ago with the release of 6-String Theory (2010) with established talent to celebrate 50-years of playing the guitar and the gifts that it had given me. I also was aware that many talented musicians were using YouTube to get their start. So I wanted to start a competition to find a "brand new" talent, and with the sponsorship of Yamaha, Monster Cables, and Berkley College of Music, we started out with guitarists in 2011. For 2012, I started the Rhythm Session album and centered the release on the guitar and I wanted to have guest rhythm sections with great performers like Chick Corea, Stanley Clarke, Marcus Miller, etc. So, I thought that we should expand the competition to find a great rhythm section. We had visits from over 152 countries on the website and received applications from over 50 countries, and we had the guitar competition running separately. The last track, Punta Del Soul, on the Rhythm Session release included the winners of the guitar and rhythm competition and I really enjoyed the formula of mixing brand new talent with established talent on a level playing field. We booked the top studio, my top engineer, we took the time to get everyone comfortable, and the result was a really great track. As an American, how did you become interested in Brazilian music? This goes back to the mid 60's and if anyone was playing the guitar, I was interested. This was the time of Tom Jobim and Sergio Mendez and Brasil 66, and I loved their acoustic guitar playing, the hypnotic rhythms, their use of jazz harmonies, and the beauty of the Portuguese language. My wife is Brazilian and I have always enjoyed working with and recording Brazilian music. Your son, Wesley, joins you on your latest release, Rhythm Sessions. How does it feel to play to have your son playing with you? It is very exciting; I did not want to push him prematurely, but there are two songs on Rhythm Session from a Swedish group called, E.S.T. (Esbjörn Svensson Trio), a band that my son turned me on to when he was 13-years old. I liked how they were modernizing the concept of the acoustic trio and I heard immediately how melodic their tunes were. I selected the track 800 Streets by Feet and Wes over-dubbed the drums; it worked out great, as he felt so comfortable with their music. 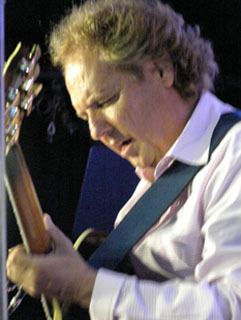 What's next for Lee Ritenour? A lot of touring is coming up as I am off to Mexico and Japan. I am also doing a symphony date of one my oldest pieces from 1978, The Captain's Journey. I am working with Gordon Goodwin who is doing the orchestration; the piece will debut in Los Angeles on November 9, 2012. I also see future recordings with my son, but I also want him to make his own in-roads in the industry. Read the review of Lee Ritenour - Rhythm Sessions in the Music Scene section. Read about Lee Ritenour's performance at the GRP 30th Anniversary Celebration at the Blue Note New York in the Performances section.